Before watching Aamir Khan's Dangal, take a look at the non-scripted, real fight of Geeta Phogat during Commonwealth Games. Before watching Aamir Khan’s Dangal, take a look at the non-scripted, real fight of Geeta Phogat during Commonwealth Games. It seems Mr Perfectionist Aamir Khan is back in form and all set to deliver a promising hit with his latest release, Dangal. The film is based on how Mahavir Singh Phogat trained his two daughters, Geeta and Babita, to wrestle in the face of patriarchy and the two girls went on to win in the Commonwealth Games. The scripted scenes in Dangal, which are a result of lot of hard work and relentless practice, are bound to move you and inspire you. 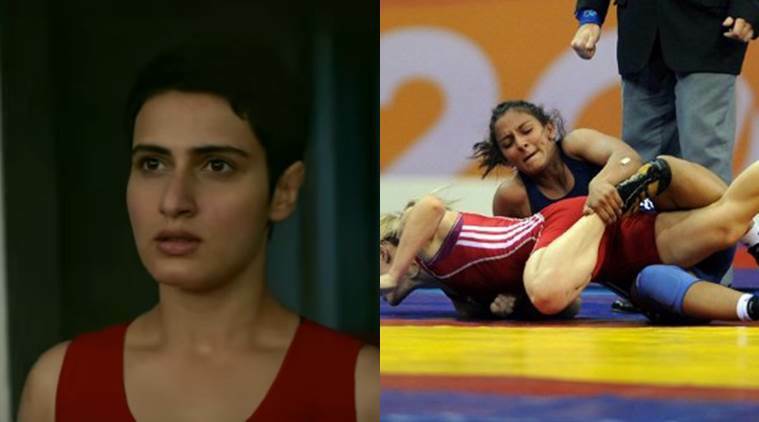 Fatima Sana Shaikh, who plays Geeta, makes the mat her own as she fights on an international level. However, the real fight of Geeta Phogat during Commonwealth Games did not involve any background music, retakes and cuts. It was raw and bruising, and all the more special for it. Watch: Geeta Phogat wins Women’s 55 kg freestyle wrestling bout! Geeta Phogat’s victory in the Commonwealth Games was one of the touching cinematic moments in Dangal. Presented in such a way that her victory belongs only to her, it is obviously a result of a lot of hard work. Coached by her father, Geeta broke records and patriarchal beliefs as she became India’s woman gold medallist at the Commonwealth games prevailing over Aussie wrestler Emily Bensted on October 7, 2010. That she was from Haryana where women are not allowed to call their life their own, made the journey even more remarkable.